Who are the most followed people on Google Plus? No Points for Guessing.. Yes, they are the photographers and Google has integrated various tools to enhance photo viewing and sharing experience on Google+. Google Plus has become a great place for sharing stuff you know, read, like, want to know etc.. and most frequently used to share images. While uploading images on Google Plus to share with your circles, you can add text on the images, choose different text fonts and also align the text. Based on you image size, you can add upto 3 lines i.e. one on Top, then middle and finally one at the bottom of the image. 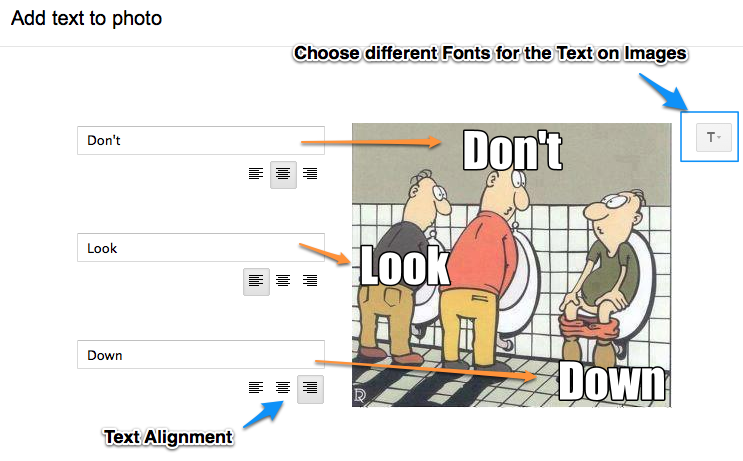 Here are the steps to add the text to the photos that you upload on Google Plus. After selecting the image from your computer and before sharing the image, you have options to Tag People, Edit Photo Add more etc. Click on “Add Text” button as shown below. It will open up a new pop up where you can add text to the image. In the new window, you will have 3 text boxes on the left hand side of the image. As soon as you start typing in these boxes, text will start appearing on top of the image. You can also align the text as per your requirement. You can add text on the Top , Middle and Bottom portion of the image. If you want to change the font of the text, you can also do that by clicking the ‘T’ button and then choosing the font that suits your image. 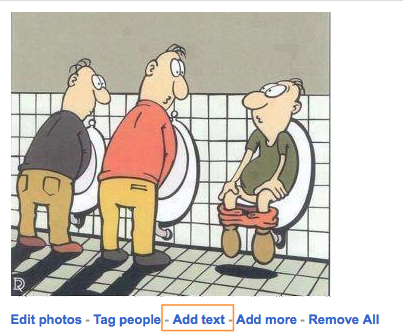 Once you have finalized the settings, click “Save” and share the edited photo with your desired circles.